An All-New Feature-Length Animated Musical! One of the best-loved holiday stories of all time is back in this animated, musical version of Charles Dickens' most famous tale. An all-star voice lineup features Whoopi Goldberg, Ed Asner, Michael York and Tim Curry as Scrooge. Come share the joy as cold-hearted Ebenezer Scrooge, the man who "bah-humbugged" his way through Christmas, discovers the true holiday spirit after he's visited by the Ghosts of Christmas Past, Present and Future. With original music and eight new songs, this uplifting, animated tale is destined to become a new holiday classic. Just what the world needs - another version of A Christmas Carol! Not only that - another animated version of A Christmas Carol! I don’t know how many cartoon takes on the Dickens classic are out there, but since I’ve already reviewed a bunch of them, I’d assume quite a few exist. For today’s iteration, we head to a 1997 adaptation. Given the fame of A Christmas Carol, a synopsis seems somewhat pointless, but I’ll provide one anyway. Ebenezer Scrooge (voiced by Tim Curry) runs his own business and is clearly a skinflint and a jerk. Isolated from others by his own accord, on Christmas Eve the misanthrope receives a visit from the ghost of Jacob Marley (Ed Asner), his old partner. Condemned to remain in limbo, Marley warns Scrooge that he’ll suffer the same fate if he doesn’t clean up his act. Scrooge initially discounts this incident, but then he receives additional visits from other ghosts. One takes him to Christmas Past (actor unknown), where he watches his childhood emotional pain as well as some romance and his ultimate shift from human affection to monetary gain. From there he goes with Christmas Present (Whoopi Goldberg), where he sees the poor but loving family of his employee Bob Cratchit (Michael York). Scrooge learns that Cratchit’s son Tiny Tim (actor unknown) will die without significant medical attention. Lastly, the Ghost of Christmas Future shows Scrooge his own fate as well as that of Tiny Tim. When the ghosts finish with Scrooge, he changes his ways and becomes a barrel of laughs. I couldn’t figure out where this version of Carol aired. I think it ran on TV but couldn’t obtain information about when and where. Based on the quality of the product, it seemed appropriate for Saturday morning TV, as it never rose above the level of material we see there. That went for virtually all elements of the production. Although Carol boasts a few moderately notable names as voice actors, their work fails to engage. Some do really poorly, like the usually-talented Kath Soucie, who delivers an atrocious British accent as Cratchit’s wife. Most just ham it up and overplay their parts. 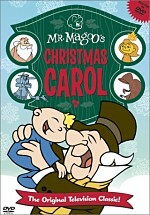 Unlike 2001’s Christmas Carol - the Movie - another cartoon adaptation - this one stays mostly close to the source material. One of the oddest changes comes from the addition of Debit, Scrooge’s pooch. Debit actively undermines the plot through his interactions with Scrooge. It’s hard to see Scrooge as wholly selfish if he’s willing to care for this dog. This makes Scrooge’s later transformation less impressive and surprising, as we can already see a caring side of the man. One could argue that this becomes irrelevant due to our familiarity with the story. One could argue that most who watch Carol will already know how it ends. However, one would probably be incorrect in this case. An animated feature such as this will appeal mainly to children, and many of them will likely be unfamiliar with the tale at that stage in their lives. As such, they’ll lose much of the impact of Scrooge’s redemption since they see this warm side of him in advance. This Carol also telegraphs the story’s moral more heavily than it should. It seems aimed at the littlest ones, which whom the filmmakers clearly felt they needed to be especially blunt. The flick spells out its concepts in a very obvious manner. Of course, we all know where the story’s going anyway, but a little subtlety would have been nice. Some passable animation also would have been great. Instead, Carol barely lived up to Saturday morning standards. When the characters moved, they did so with extremely broad gestures. Much of the time the cartoons stood still - movement means money! This makes the end product exceedingly stiff and unnatural. Add to that some totally forgettable songs and tacky, simplistic art to ensure that this take on A Christmas Carol lacks any redeeming values. It tells the same old story without any creativity or flair. It’s lowest common denominator product. 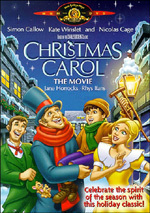 A Christmas Carol appears in an aspect ratio of 1.33:1 on this single-sided, single-layered DVD; due to those dimensions, the image has not been enhanced for 16X9 televisions. Despite some minor concerns, most of Carol looked reasonably good. Some of the problems resulted from the cheapness of the animation. The inexpensive work showed a mix of concerns that usually don’t appear during more accomplished material. For Carol, sharpness generally seemed acceptably crisp and distinct. However, some shots came across as a bit on the soft side, and overall definition could have been a little stronger. Periodically I saw oddly blurry shots, such as when Scrooge first flew with the Ghost of Christmas Past. Moiré effects caused no issues, while jagged edges were mild distraction. Occasional specks, dirt and marks appeared, but those stayed minor. Happily, colors conveyed a pleasant impression. The hues consistently seemed bright and vivid throughout the show. These tones demonstrated nice depth and distinctiveness, and they didn’t display any problems such as bleeding or noise. Overall, the colors were clear and appropriately cartoony but not overblown. Black levels also seemed nicely deep and rich, but shadow detail appeared slightly heavy at times. For example, some bedroom sequences came across as a bit thick and heavy. Nonetheless, those sequences appeared reasonably concise. Overall, the picture of Carol suffered from the production’s cheapness but it seemed pretty vibrant nonetheless. When I examined thestereo soundtrack of A Christmas Carol, I found a mediocre affair which demonstrated a predictably forward emphasis. The front speakers showed good stereo separation for the music and also gave us a reasonable level of ambient information. Not much distinctive information appeared from the sides, but the general atmosphere seemed fairly lively and useful. The surrounds occasionally kicked in some light atmosphere like the echo of Marley’s voice, but not much came from the rear speakers. Audio quality appeared good. Dialogue always sounded natural and crisp, and I heard no problems related to intelligibility or edginess. Effects came across as accurate and clean, with good reproduction that lacked signs of distortion. The music seemed bright and rich, as it demonstrated nice dynamic range. Low-end elements appeared warm and tight, as the show offered a good level of depth. The mix remained too subdued and lackluster to earn above a “C+”, but it wasn’t a bad track. Absolutely no extras show up for Carol. In fact, this cheap DVD doesn’t even bother to present a main menu! The movie just starts, which means no conveniences like easy chapter access. 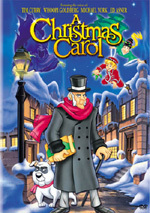 With so many other versions of A Christmas Carol on the market, is there any reason to pursue this 1997 edition? Nope. It’s a cheap and crude piece of product at best. The DVD presents passable picture and sound but no extras. Avoid this lousy stinker.